Sunday’s race, won by María Mercedes Alvarez Pontón of Spain, took 100 horses and their riders across a Kentucky landscape of tobacco and thoroughbred farms as competitors tested the stamina and grit of their prized Arabian horses. Much is made of the long ride, but seasoned competitors know the race is often won or lost when horse and rider are not on the course. The endurance competition is as much a Nascar race as it is a horse marathon: a winning strategy often plays out in the rest period between the race’s six loops, when riders cool and relax their horses so they can pass a range of medical tests and advance to the next stage as quickly as possible. Teams left little to chance during Sunday’s race, which is on a par with the Olympics among endurance riders. As soon as riders pulled their horses into a cooldown area, grooms worked in tightly choreographed motions, yanking saddles and dousing the animals with buckets of ice water. Horses cannot move to the mandatory veterinarian check until their heart rate drops below 64 beats a minute. Maintaining such expert crews takes deep pockets, and for several top competitors, that is not a problem. The modern-day sport of endurance riding began in the 1950s in California, but an influx of money from Arab royalty in the last decade has transformed it into a pastime of kings and sheiks. The royal families of Qatar, Bahrain and Dubai maintain vast stables of horses that have been bred and conditioned for the epic rides as well as high-performance centers devoted to the sport. Sheikh Mohammed bin Rashid al Maktoum of the United Arab Emirates has the early lead in the Alltech FEI World Equestrian Games endurance event. The check came after the first 32 1/2 kilometers — about 20 1/2 miles — of the 100-mile race. Mercedes Tapia of Argentina, riding Ras Senor, led early Sunday in the 100-mile Endurance event at the Kentucky Horse Park. Right behind the sheikh is the reigning world champion, Maria Mercedes Ponton of Spain, riding Nobby. Then came Sheikh Hamdan bin Mohammed Al Maktoum on SAS Alexis, and Sheikh Rashid Dalmook Al Maktoum on Rukban Dikruhu MMN, both of the United Arab Emirates. Fifth was the leading American, Heather Reynolds, on Ssamiam. Deborah Reich, the Team USA alternate, moved into the lineup because Ellen Rapp’s mount Berjo Smokey was lame. • While most entrants rode off to a cheering crowd, one did not. The Canadian horse RBF Super Sport, ridden by Ruth Sturley, wanted nothing to do with the noise and balked at the start line. Not until the crowd quieted was Sturley able to urge her horse on, about four minutes behind the leaders. Cutting-edge GPS technology will provide real-time tracking of the 2010 Alltech FEI World Equestrian Games (WEG) Endurance competitors as they race tomorrow in Lexington, Ky.
"Anyone with a laptop will be able to track the horses, at the event, or at home, around the world," explained Emmett Ross, endurance discipline manager for WEG. Ross also noted the system will be in place in the staging area to alert crews when their horses are coming into a vet check and allow them to adjust race strategy based on knowing competitors' positions. For equine enthusiasts on site at the Kentucky Horse Park, several large viewing screens will be stationed around the park in the trade show and hospitality areas, and perhaps other sites to enhance viewing of the lengthy WEG event, projected to last around eight hours. Announcements will also be broadcast on site alerting spectators when horses will be arriving in the vet-check staging area. The GPS system initially will be set to "ping" or update data every 30 seconds. Ross plans to lower the update rate to six seconds near the finish, where at that time, "You will be able to really see that little icon move along." Because the Kentucky course does not allow spectators on the trails, public roads, or private lands where horses are competing, "This system will be a way to allow everybody to view the event," said Ross. Swipe cards will also be added to enhance efficiency at the games. According to Becky Hart, chef d'equipe of endurance Team USA, the cards have been used in the Middle East and Europe and furnish valuable time-tracking data to crews and event veterinarians. Ross also noted a back-up system is in place, should electricity fail. When a horse comes into a vet check, a crew member swipes that rider's card which records that horse's number, team, and logs the time of when the horse entered vet check. When the horse is presented to the vet to determine if his or her heart rate has dropped to the required rate to allow the horse to continue, the card is swiped again. After a set number of horses have swiped a computer printout is generated. Because the time between check in and pulse down can be indicative of a horse's fatigue, Hart explained print-out access allowed one to, "keep an eye on the competition" by watching for an increase in pulse-down time. "It also allows me to keep track of each loop time, for my team and [their] competitors," Hart continued. According to Ross, the computer print-outs assist event-monitoring veterinarians in awarding Best Conditioned awards by providing a summary of pulse-down times over the 100 mile race. Soundness after the event will also be keenly scrutinized, but the swipe card's fast, accurate analysis of each horse’s pulse rate data is a valuable veterinary analysis tool. During the vet checks, hand-held heart rate monitors will connect to large viewing screens, allowing spectators to see for themselves the equine athlete’s moment of reaching the criteria needed to start another loop. The Dubai royal family will bid to cement the UAE’s position at the top of the endurance riding field this afternoon when they compete on the second day the 2010 World Equestrian Games at Kentucky Horse Park in Lexington. Sheikh Mohammed bin Rashid, Vice President of the UAE and Ruler of Dubai, leads his sons Sheikh Hamdan and Sheikh Majid in a five-man team that will compete against 29 other nations over the challenging, 160km endurance course. Sheikh Rashid Dalmouk Al Maktoum and Ali Mohammed al Muhairi make up the rest of the side. Sheikh Mohammed led home his sons when they won the Stars Challenge race at Austin Park in England on July 25, a success that makes the region favourites to win the punishing race. “The team have prepared as best they can,” said Mohammed Essa, the assistant team manager. The race, sponsored by Meydan Racecourse, consists of six loops of varying distances, with each loop starting and finishing at the compound’s Forego Polo Field. All riders start at the same time, and there are five mandatory veterinary stops. The winner is judged by completing the course in the shortest time, which is likely to be around the 12-hour mark. Endurance riding is the ultimate test of speed and stamina for a racehorse and jockey combination, as it requires the riders to understand their mount’s abilities. The ruler of Dubai, who rides Arcadienne, has not raced competitively since his victory in England, but Essa does not believe that to be a problem. “From the end of July he has just been preparing himself, not necessarily just for this event, but for the rest of the year. Due to the hardy nature of the breed, the majority of competitors, including the UAE, will race on pure-bred Arabians. The rest will challenge on Anglo-Arabs, which are half thoroughbred on the distaff side, and half Arabian. The Games run until October 10, during which time 54 national federations will compete in eight equestrian disciplines, including dressage, driving, eventing, jumping, reining and vaulting. SUPREME Council for Youth and Sports president and Bahrain Olympic Committee president Shaikh Nasser bin Hamad Al Khalifa will arrive today in the US to lead a five-member Royal Endurance Team in the endurance horseride event of the Alltech FEI World Equestrian Games, scheduled for Sunday in Lexington City, Kentucky. Shaikh Nasser will be accompanied by Supreme Council for Youth and Sports first vice-president and Bahrain Royal Equestrian and Endurance Federation president Shaikh Khalid bin Hamad Al Khalifa, who however, is not taking part in the ride due to a recent wrist injury. Other members of the Bahrain Royla Endurance Team are Ghazi Al Dossary, Ahmed Abdulla, Jaffer Mirza and Abdulrahman Al Saad. It will be the fourth appearance for the Bahrain team in the World Championships, having taken part in the 2005 and 2006 edition cups in Dubai and Aken, Germany, respectively, before winning an impressive third-place finish in the 2008 event in Malaysia. Other members of the Bahrain team arrived yesterday after an 18-hour trip via London. On arrival, the Bahraini riders were given a special welcome by hundreds of volunteers at the endurance village. 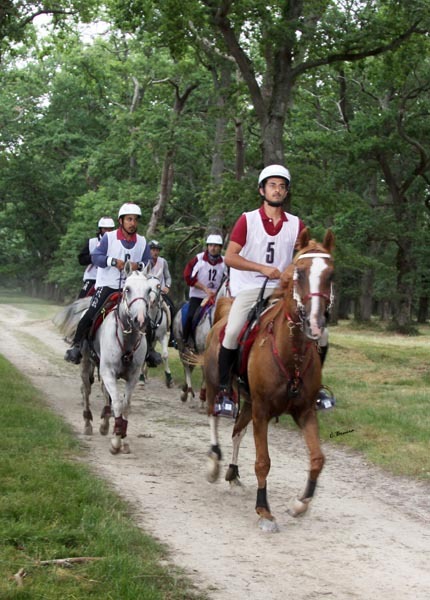 Commenting on the occasion, Shaikh Nasser expressed delight in taking part in an endurance ride in the US for the first time, adding that his team was looking forward to clinching a place among the top countries. Shaikh Nasser said the team is well-prepared for the ride after successfully completing races in France, UK and Germany during their training camp earlier this summer. The Royal Endurance Team leader extended his appreciation to His Majesty King Hamad for the continued support to endurance riders in Bahrain in general and to members of the team in the World Equestrian Games in specific. Al Khaldiya Team captain Shaikh Khalid stressed the importance of taking full advantage of competing with the world's best in this international gathering. Shaikh Khalid, who celebrated his birthday yesterday, said he is working hard on preparing the team to achieve remarkable results in international championships. He expressed sadness over his inability to join his team members in this world event but said that the rest of the Bahrain team along with team leader Shaikh Nasser are capable of putting in an impressive show. The 2010 World Equestrian Games have not even started yet and we are already sadly have to report that one WEG qualified horse got ill. Belgian endurance team horse Poespass suffered from a severe colic attack and had to be operated on. The horse was in quarantine in Cincinatti and was supposed to arrive in Lexington at the Horse Park today. Poespass is owned and competed by Karin Boulanger. The combination was the 2008 Belgian Endurance Champion and winner of the 2008 CEIO Gubbio (160 km) in Italy. Poespass is a seasoned traveller. A few hours after his arrival in quarantine the chestnut suffered from a bout of colic. The horse was transported to the Hagyard Equine Clinic near Lexington where he was operated on in the evening of 20 September 2010. Belgian team vet Jef Desmedt was present during the whole operation. Poespass made it through surgery but the next 24 hours are of course critical. Naturally the horse can no longer participate in the World Equestrian Games. The Belgian endurance team, managed by chef d'equipe Pierre Arnould, is now left with three combinations and no longer has a scratch score. We wish Poespass a speedy recovery. Doha, Qatar - The Al Shaqab Endurance Team will represent the State of Qatar at the prestigious World Equestrian Games in Lexington, Kentucky, USA, on Saturday, Sept. 26. The five-member team will compete in the 160km race over varied terrain to vie for the title of World Champion Endurance team against 26 teams and a total of 162 nominated competitors from all over the world. The World Equestrian Games are the official world championships competitions for the eight equestrian disciplines recognized by the Federation Equestre Internationale (FEI), which is the world governing body of equestrian sport. The championship disciplines consist of Show Jumping, Dressage, Para-Equestrian Dressage, Eventing, Driving, Endurace Racing, Vaulting and Reining. The Al Shaqab Endurance Team is the reigning Silver Medal winning team from the World Endurance Championships that are held every two years and most recently in Malaysia in 2008. This marks the first time the team has competed in the United States and their fourth consecutive appearance in the World Championships. The five Al Shaqab riders who will participate on the Qatar team are Faleh Nasser Bughenaim, Mohammed Tahous Al Naimi, Abdul Rahman Al-Sulaitin, Jassim Mohammed Al-Maadhadi and Mohammed Sultan Al Suwaidi. Bughenaim, a veteran rider from the 2008 Silver Medal team, who finished 12th individually in the World Championships, scored three wins over the summer in Uruguay and France. Al Naimi is a 13-year veteran of the Al Shaqab team who competed on the Silver Medal team and is the oldest competitor on the team at age 31. Al Sulaitin earlier this summer won a 160km CEI*** race in La Baguala, Uruguay. Al Maadhadi brings a win from the summer campaign from the CEI** 120km race in Negrepelisse, France. Al Suwaidi did not ride in 2009 due to college studies, but has returned to the team in 2010 with solid performances and top five finishes in the past three races in England, France and Uruguay. The Al Shaqab team representing the State of Qatar is led by Chef d’Equipe Fahad Saad Al Qahtani, Director of Al Shaqab, manager and trainer Hadi Nasser Al Naimi, assistant trainer Jabr Nasser Al Naimi, and assistant trainer Abdul Aziz Saleh Al Jabir. His Highness, The Emir, Sheikh Hamad bin Khalifa Al Thani founded Al Shaqab in 1992 to preserve and further develop the Arabian horse in Qatar. Al Shaqab is led by H E Sheikh Mohammed Bin Hamad bin Khalifa Al Thani and encompasses an Endurance Team, Breeding & Show division, Riding Academy. In 2004, Al Shaqab proudly became a member of Qatar Foundation. Al Shaqab’s mission is to promote the highest standards in the breeding and showing of Arabian horses and serve as a community resource with innovative, educational and competitive opportunities in all of the equestrian arts. Top photo: Following a summer campaign in France (pictured) and Uruguay, the Qatar Endurance Team will compete in the World Endurance Championship this Sunday in the United States. Dubai, UAE, 23 September 2010 - Meydan reaffirms its commitment to international equestrian sports as the Gold Sponsor of the Endurance Championship at the 2010 Alltech FEI World Equestrian Games (WEG) held in Kentucky, the United States of America. The sponsorship aligns Meydan along the objectives of the Fédération Equestre Internationale (FEI), with support across other initiatives such as the FEI Nations Cup for show jumping, which Meydan has been the title sponsor of for the past 2 consecutive years. Meydan’s exhibition booth is located near the Trade Stands and will showcase an informative and educational experience for the public, including give-aways and exhibition displays of the Meydan City project in Dubai and of its deep-rooted equine heritage. The Endurance Championship will be held on 26 September 2010, Day 2 of the Games at Kentucky Horse Park in Lexington, the United States of America. The participating teams at this year’s Games will have 5 riders instead of the usual 6, and will consist of the best endurance riders worldwide. One of the 8 equestrian disciplines including dressage, driving, eventing, jumping, para dressage, reining and vaulting, the Endurance Championship is held over a distance of 160 km across altitude differentials of 300 feet in Kentucky Horse Park and surrounding farmland, with 5 compulsory stops for veterinary checks. The course comprises of 6 loops varying in lengths between 18 to 40 km, with each loop starting and finishing at the Forego polo field. The race will start at 7:00 a.m. with the winners expected to cross the finish line at 7:30 p.m. A majority of the participating horses will be pure-bred Arabians, with the remaining predominantly Anglo-Arabs – half thoroughbred (mare) and half Arabian (stallion). Meydan City is the brainchild of His Highness Sheikh Mohammed bin Rashid Al Maktoum, Vice President of the United Arab Emirates, Prime Minister and Ruler of Dubai. It is the culmination of his vision to create not just the ultimate venue for horseracing, but also an integrated city that is sustainable, environmentally responsible and also one that positions Dubai at the centre of the competitive global business stage. Meydan Grandstand and Racecourse can accommodate a capacity of 60,000, and features fine-dining restaurants, covered car parking for 8,600, the Meydan Museum and Gallery, an IMAX Theatre, the Meydan Boathouse, and the world's largest and longest trackside LED panel. The Dubai Racing Club, Emirates Racing Authority and Meydan Freezone Falcon Commercial Park offices are located here. Meydan Racecourse district will also feature a 9-hole golf course, showroom district and luxury residential villas to rival those in any cosmopolitan city. With its Freezone status geared to businesses who are looking to be at the gateway to Europe and Asia, Meydan City is one location that offers a myriad of investment opportunities and experiences, delivering a perfect platform for business, entertainment and lifestyle. New Zealand's 2010 World Equestrian Games is about to begin in earnest, as the Kiwi endurance riders prepare to take on the best in the world. While the actual 160-kilometre race starts on Sunday, their games really start on Saturday, before the opening ceremony has even happened, when their horses will face their first vet check. Endurance chef d'equipe Madonna Harris says it will be a testing time, although she has every confidence in her trio of riders. And at any time, if the horse's heartbeat doesn't come down fast enough or there is a niggle of any sort, a combination can be pulled from the race. With just three in the New Zealand team, there is no room for error, with no chance of any team accomplishment if all don't finish the race. And the input of those supporting the riders is just as important as those on the horses. The heat will be another big challenge for the endurance competitors, as will the mass start. Around 130 combinations are expected on the start line. Anxiety levels will be fever-pitch and that half hour before the race, and half hour into the race, can be make or break. “Everyone is wired,” says Harris. “There are flags, banners and general mayhem going on – our riders just need to find an area and remain calm.” Combinations will do six loops of varying distances throughout the race – the shortest is 18 kilometres, and the longest 39.9 kilometres. “This is a four star rated race and calls for courage and control.” That's the highest ranking, and only held at World Games of World Championships. The Kiwi horses left New Zealand late August and have now acclimatised well. Harris says each is in peak condition and now ready to race. In recent days they've had plenty of attention, including the magic hands of New Zealand team equine physiotherapist Nikki Lourie. Harris is picking a Spanish combination to take the individual and perhaps United Arab Emirates for the individual. The World Equestrian Games are being hosted in Lexington, Kentucky, and run through until October 10. New Zealand is represented in showjumping and eventing as well as endurance. It is the first time the games have been held outside of Europe and will attract more than 800 riders from nearly 60 countries. It is expected to be worth around $US150 million to the economy. This Saturday brings opening ceremonies of the 2010 Alltech FEI World Equestrian Games at the Kentucky Horse Park in Lexington, Kentucky. Serving as the Olympics of the equestrian world, this event has been held every four years since its start 20 years ago in Stockholm, Sweden. Having made stops in the Netherlands, Italy, Spain, and Germany since then, the Games come to the US in 2010 for the first time. The World Equestrian Games cover a huge variety of different subcultures within the equine world with eight disciplines having their own competitions at the 2010 Games. Jumping, Dressage, Eventing, Driving, Endurance, Vaulting, Reining, and Para Dressage are featured at the 2010 World Equestrian Games, with Para Dressage making its WEG debut at the Kentucky Horse Park. The welcome-bienvenue-willkommen banners are up, the Horse Park has turned into a vista of white tents, and downtown streets are, well, nearly clear of construction as Lexington prepares to welcome thousands of visitors starting Saturday for the Alltech FEI World Equestrian Games. In the Kentucky Horse Park's main stadium, a troupe of black Friesian stallions pranced together in perfect synchronicity Monday as they practiced for the opening ceremony on Saturday night. They appeared calm despite the roar of tractors delivering bushes around the rings as technicians plugged in sound systems high above their heads. "We're getting it all together," said Everett McCorvey, the University of Kentucky opera director who is producing the opening ceremony. "The horses practice during the day, and the humans practice every evening." The largest, deepest pool of equine talent ever assembled has arrived in Kentucky. And, no, it’s not the contenders for the 2010 Breeders’ Cup World Championships. Some 800 horses from all corners of the globe are converging on the Kentucky Horse Park for the Alltech FEI World Equestrian Games, making Lexington inarguably the Equine Capital of the World from Sept. 25-Oct. 10. During the 16-day run, horse-and-rider combinations from 58 nations will participate in eight internationally recognized disciplines: dressage, three-day eventing, show jumping, reining, driving, vaulting, endurance, and paraequestrian. For equine sport aficionados, it’s like having the Super Bowl, World Series, NBA Finals, World Cup soccer finals, and PGA Championship back to back in one location. The United States made the successful bid four years ago to host the 2010 event, the first World Games ever staged on American soil. Securing, organizing, and producing the Games has been no easy task, particularly in the wake of a worldwide recession. Ticket sales have fallen well below the projected 600,000-plus, causing organizers to abandon free shuttle service and other amenities and to charge high prices for parking. The high cost of attending the Games has drawn much criticism. Other worries abound, from potential traffic nightmares to the impression downtown Lexington will make on worldly visitors. New Zealand's three endurance riders are ramping up preparations ahead of the World Equestrian Games in Kentucky, United States, which start at the weekend. Jenny Chandler, Alison Higgins and Debby Worsfold will be the first New Zealanders in action when they line up for the vet check with their horses on Sunday (NZT), followed by their 160km race on Monday. The team have been based on a farm not far from the Kentucky Equestrian Park in Lexington, but will move in to their official stables on Saturday. Endurance chef d'equipe Madonna Harris said she had confidence in her trio of riders, who had prepared well. "Of all the disciplines, this really is the toughest," she said. "Throughout the race we present to the vets seven times." At any stage in the race, if a horse's heartbeat does not come down fast enough or there is a niggle of any sort, a combination can be pulled. And with just three in the New Zealand team, there is no room for error. All three combinations must finish the race to have a chance in the team category. About 130 combinations are expected to make the start line. "Everyone is wired," Harris said. "There are flags, banners and general mayhem going on - our riders just need to find an area and remain calm. As good as these riders are, they are completely inexperienced at this level, so it is a big ask for all." New Zealand's eventing horses arrived from Europe today and riders Mark Todd, Andrew Nicholson, Caroline Powell and Jonathan Paget have all flown in to join teammate Clarke Johnstone, who arrived with the Australian team earlier this week. The eventing starts on October 1 (NZT). Katie McVean is the only showjumper already settled in Lexington, with the rest due to arrive next week. The showjumping starts on October 5, with the Games finishing on October 11. It is the first time they have been held outside of Europe and more than 800 riders from about 60 countries are competing. Endurance competition tests the speed and endurance of the horse and the management skills of the rider, who must have a knowledge of pace and efficient and safe use of the horse over considerable distances. The ride is 100 miles, held on one day in six stages with a compulsory stop after every phase for veterinarians to check the horses' fitness to continue. A horse's heart rate must return to 64 beats per minute within a certain period before it can advance to the next loop. There also are mandatory “hold times” or rest periods, varying from 30 to 50 minutes depending on the phase, before competitors can go to the next stage. The competitor who finishes the race in the shortest time — and whose horse passes a final veterinary exam and post-race drug testing — wins. A competitor is timed not only while on the course but until the horse's heart rate returns to normal and it goes to the vet gate. Abu Dhabi : The UAE endurance team, likely to be led by His Highness Shaikh Mohammad Bin Rashid Al Maktoum, Vice-President and Prime Minister of the UAE and Ruler of Dubai, is to start as one of the favourites in the multi-discipline Alltech FEI World Equestrian Games (WEG) which will start on September 25 in Lexington, Kentucky. Shaikh Mohammad, along with Shaikh Hamdan Bin Mohammad Bin Rashid Al Maktoum, Crown Prince of Dubai, and Shaikh Majid Bin Mohammad Bin Rashid Al Maktoum, Chairman of Dubai Culture, are part of the seven-member team which has qualified for the 160km endurance championship scheduled on September 27. The UAE has also qualified for the showjumping event, which will be held in October at the Kentucky Horse Park which will stage all eight equestrian disciplines. National federations for 58 countries have submitted entries for the 2010 Games with Australia, Canada, Germany and the United States taking part in all eight disciplines which include dressage, driving, endurance, eventing, jumping, para dressage, reining and vaulting. The UAE endurance team has qualified nearly 12 horses, but only four riders and horses for the team championship and one rider for the individual championship will be permitted to represent the country. Shaikh Ahmad Bin Mohammad Bin Rashid Al Maktoum won the endurance individual gold at the 2002 WEG held in Jerez, Spain. The World Equestrian Games (WEG) are comprised of the world championships for eight equestrian sports and are held every four years, two years before the Olympic Games. An FEI press release says the largest commercial airlift of horses ever undertaken for a single event began from Belgium this week — heading to the United States for the first time in the event's 20-year history. Almost 450 horses will be departing Europe in the coming days until September 29, in 10 charter flights equipped for the task, leaving from Belgium's Liege airport and the Amsterdam airport. These European charter flights form part of an even larger worldwide airlift of horses competing in the September 25 and October 10 Games, organisers said. In addition to the 445 horses departing from Europe, 19 horses from Australasia and 35 from South America are to fly to the United States in the coming week. The largest commercial airlift of horses ever undertaken for a single event has begun in Belgium. Almost 450 horses will depart from Europe in the second half of September bound for the US to take part in the Alltech FEI World Equestrian Games. Each horse must travel on its own passport, although unlike human passports with photographic identification, horse passports contain a markings diagram or in some cases microchip data. Each horse must also have an export health certificate. 'You don't have a photo they have a marking diagram a diagram of a horse and all horses have white sox or different coloured mains or whatever and a branding on them perhaps and thats all marked on there so they can look at it and see which horse it is,' Henry Bullen, Director, Peden Bloodstock, said. The European charter forms part of an even larger worldwide airlift of horses which will compete in eight different disciplines at the Equestrian Games in Lexington, Kentucky. Largest Commercial Airlift of International Horses Heads to the 2010 Alltech FEI World Equestrian GamesThe largest commercial airlift of horses ever undertaken for a single event will depart from Belgium this week heading to the Alltech FEI World Equestrian Games, which are taking place in the United States for the first time in the 20-year history of the event. Almost 450 horses are departing Europe between the 16th and 29th of September. Ten specially constructed charter flights will leave from Belgium’s Liege airport and the Amsterdam airport over the next 14 days. These European charter flights form part of an even larger worldwide airlift of horses competing in the eight different disciplines of the Alltech FEI World Equestrian Games in Lexington, Kentucky between September 25th and October 10th. In addition to the 445 horses departing from Europe, 19 horses from Australasia and 35 from South America will fly into the United States in the upcoming week. The airlift is the largest ever undertaken for one event due to the World Equestrian Games being held on American soil for the first time. The Games will be the largest sporting event in the United States this year. The horses will be flown to Cincinnati where they will spend a minimum of 42 hours in quarantine before competing in the Games. During the nine-hour journey from Europe, the horses will be cared for by a team of 24 individuals, including grooms, attendants and vets, many of them professional flying grooms who make their living tending to the needs of their equine passengers. Flying grooms will be supplied by Peden Bloodstock, the company responsible for arranging the air charters. Head Groom Tim Rolfe, who has overseen six Olympic and five World Equestrian Games airlifts, explained that the grooms must spend many months in training to undertake such journeys. “Most of us come from racing or grooming backgrounds but we have to undertake similar training to commercial airline cabin crew, particularly as we have to look after the human passengers as well,” said Rolfe. Like most commercial passenger flights, the horses travel in a specified cabin class, with the majority travelling “business class”. The class of cabin is determined by the number of horses in each “air stable”. Those traveling economy will be three to a container, two horses will share business class containers and those in first class have the air stable all to themselves. Only one horse will get a luxury flight from Belgium, but the high-flyer’s identity is staying firmly under wraps. Ticket prices range from €8,500 to €13,000 depending on the class selected, but considering most of these horses are worth several million Euro, it is money well spent. The horses’ safety and welfare are paramount, and pilots are specially trained to ensure that the take-off and landings are smoother than usual. The take-off will involve a more gradual climb, and a much slower braking system is adopted for the landing. The horses have a constant supply of in-flight food. They can snack on hay nets, nuts, oats and bran. Over 1,500 litres of water will be taken on board to ensure the equine passengers are kept well hydrated while in the air. In-flight entertainment is taken care of by the flying grooms, according to Peden Bloodstock Director, Henry Bullen. “It is too loud on board to warrant anything like soft music, but there are plenty of bad jokes from the flying grooms to keep everyone entertained. The flight, once in the air, is generally smoother than on the road however, unless of course there is the odd patch of turbulence,” said Bullen. Once the horses arrive in Cincinnati, they will spend up to 42 hours in a quarantine facility near the airport before departing on the 90 minute road trip to the Kentucky Horse Park, venue for the 2010 Alltech FEI World Equestrian Games. Lindsay Graham on Monk will be the individual rider. The US Team Alternate is Deb Reich on DJB Juniper. Lexington, KY–9 days to go–A temporary equine quarantine facility at the Cincinnati/Northern Kentucky Airport is ready to facilitate the entry of horses from around the world competing in the eight World Championships of the 2010 Alltech FEI World Equestrian Games, September 25-October 10 at the Kentucky Horse Park. LEXINGTON, KY - 9 days to go - World-renowned boxing legend, humanitarian, global icon and Kentucky native Muhammad Ali will take center stage when the Alltech FEI World Equestrian Games begin in Lexington, Ky., in nine days. The Champ will join a cast of nearly 1,500 people, ages eight to 80, and almost 200 horses from as far away as Australia for an opening ceremonies celebration of dreams that will play tribute to the Games’ American debut with scenes of the prairie, Broadway, the Wild West, and the Deep South. The show will journey through the history of horses and man as well as iconic moments in U.S. history and culture, beginning with America’s Native American heritage and a prayer for all nations by Lakota chiefs, and concluding with a Mardi Gras extravaganza that will see all cast members join together in a jubilant parade. The two and a half hour show will include 40 different acts, including Kentuckian Wynonna Judd; opera stars Denyce Graves, Cynthia Lawrence and Ronan Tynan; Sara Lee Guthrie; Cherryholmes; and Jazz at Lincoln Center, among other notables. Following in the tradition of World Equestrian Games’ opening ceremonies, a special musical score has been composed for the 2010 Alltech FEI World Equestrian Games. McCorvey and his team entertained pieces from composers around the world and selected Jamie Burton of London, England. His “World Equestrian Games Fanfare” will debut at the opening ceremony with a 100-piece orchestra from the University of Kentucky. Opening ceremony tickets are still available, but selling quickly. To secure your tickets today, please visit www.alltechfeigames.com or call 1-888-934-2010. Muhammad Ali and his wife, Lonnie, founded the Muhammad Ali Center in Louisville, Kentucky in 2005. On behalf of Ali’s home state, the cultural and education center that bears his name, and one of the Center’s important international partners-Alltech—he proudly makes this significant Opening Ceremonies appearance, similar to his historic appearance at the 1996 Olympics in Atlanta, GA. The Muhammad Ali Center is a cultural attraction and international education center that is inspired by the ideals of Muhammad Ali. Featuring an award-winning visitor experience, educational and public programming, and global initiatives, the Ali Center reaches beyond its physical walls to fulfill its mission: To preserve and share the legacy and ideals of Muhammad Ali, to promote respect, hope and understanding, and to inspire adults and children everywhere to be as great as they can be. Founded by Dr. Pearse Lyons, Alltech is a global animal health and nutrition company with 30 years’ experience in developing natural products that are scientifically proven to enhance animal health and performance. Headquartered in Nicholasville, Alltech trades in 120 countries and has 2,300 employees worldwide. Sir Smith (Smitty) has been withdrawn from consideration for the US Endurance Team for the World Endurance Championship. Sir Smith injured himself slightly either in his stall or turnout a week ago. The hind end lameness did not appear to be serious and appeared to get better, but it showed up again today. Rider Jeremy Reynolds formally withdrew him today. Wife Heather Reynolds said, "It would not be fair to Smitty, the team or himself to do this [warm Sir Smith up well so he'd trot out sound] for our final trot out on Friday morning. It was very improbable that Smitty would be able to go 100 miles in 10 days looking the way he does." The Reynolds have another horse among the 8 riders and 10 horses vying for a slot on the US Team - Heather and Ssamiam. Cici Butler Stasiuk and DJB Cytron Kon JMF also withdrew last week when Cytron came up with a lameness. Tomorrow the 5 horse and rider teams for the WEC will be chosen at Shaker Village tomorrow. Following a long process of appeal with the FEI, Christine Yeoman has been cleared of any negligence relating to the positive test of her horse Gai Forest with ractopamine in 2009. The temporary quarantine facility at the Cincinnati/Northern Kentucky Airport is ready to receive the first of its nearly 500 equine guests today in the lead-up to the World Equestrian Games in Lexington. The games start on September 25 and run through to October 10 at the Kentucky Horse Park. The airport has been classed as a temporary port of entry for the horses heading to compete at the games. 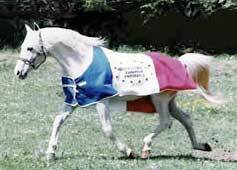 Last Friday the first group of eight horses representing Chile and Guatemala in Endurance arrived at the Kentucky Horse Park. The horses had been quarantined in Miami since their flight to the United States and travelled via trailer to Kentucky. The first horses from Europe and the Middle East are scheduled to arrive today via non-stop flights from Belgium. About 50 horses and their attendants will travel on each of these special flights into the airport. When the horses from Europe and the Middle East begin arriving Thursday at the Cincinnati/Northern Kentucky International Airport, they probably won't feel like they are in Kentucky for the Alltech FEI World Equestrian Games. They might feel as if they are in limbo. Technically, they are. They will be in quarantine, isolated from U.S. air, water, soil and other animals until the U.S. Department of Agriculture and the Kentucky Department of Agriculture have determined they are free of a set of rare diseases with deceptively benign-sounding names (like glanders or dourine) that are generally incurable and often fatal. A second horse in Kentucky was confirmed this week with having West Nile virus (WNV). The 6-year-old Morgan stallion, located in Shelby County just southeast of Louisville, was found down and unable to rise and was later euthanized. Just as with the first Kentucky horse, this WNV-affected horse was not vaccinated for the mosquito-borne virus. In 2009 eight horses in Kentucky were confirmed with having WNV, with six confirmed as unvaccinated. So far there have been 27 WNV cases in the United States and 150 confirmed cases of eastern equine encephalitis (EEE), according to the USDA's National Animal Health Surveillance System. As the seasons begin to change, horse owners are encouraged to discuss vaccination boosters for their horses for WNV and EEE. You can read more about boosting your WNV and EEE vaccinations on TheHorse.com. Endurance riding has a history that dates back to when horses were first used to travel long distances as a means of transport. As a form of competitive sport though, endurance riding first emerged in the USA in the 1950s, and reached Europe in the 1960s. In 2010, it’s a real test of both horse and rider fitness with events covering distances of up to 160km, which means many hours in the saddle. As a nation, Great Britain has taken an Endurance team to every World Equestrian Games (WEG) since the first in 1990, where they won Team Gold. Since then, results haven’t been quite as strong but this year’s team represents our best chance of bringing home a medal for many years. Beccy Broughton-Booker, Ros Clapp, Janice Cockley Adams, Christine Yeoman and David Yeoman make up a strong team with plenty of experience at Championship and International level. Liz Finney, Endurance Chef d’Equipe discusses the team’s prospects and preparation in the lead up to the Games which start on 25 September in Kentucky, USA. “We have a really strong team of five riders going to WEG who all have competed successfully in International rides on many occasions. After winning Gold in Stockholm, our results haven’t been quite as good but we’re hoping for a strong show in Kentucky which will help put British Endurance back at the top of the sport. The New Zealand Endurance Team's three Endurance horses arrived in Kentucky two weeks ago and have settled in well at a private stable 10 minutes from the Kentucky Horse Park. The riders along with Team Manager Madonna Harris and trainer Ray Tylee and three grooms are settling into their training and build up to going into the Kentucky Horse Park on the 24th September, two days prior to their competition. The rest of the Endurance groom Team members leave New Zealand on Tuesday. Lexington, KY - September 10, 2010 - With just 14 days until the opening ceremonies of the 2010 Alltech FEI World Equestrian Games, the first group of eight horses arrived at the Kentucky Horse Park on Friday afternoon. This first group of equine athletes will compete at the Games in the World Championship of Endurance presented by Meydon, representing Chile and Guatemala. The horses have been quarantined in Miami since their flight to the United States and have traveled via trailer to Kentucky. While the athletes are not arriving with these horses, this first group of equine athletes arriving to the park signifies that the Games are getting underway! The first of the horses from Europe will be arriving at next week and will be in quarantine in Northern Kentucky. One of the most famously hard rides in Europe will take place tomorrow in southern France for the 30th time: the 160-km Florac. It is also the pre-ride for next year's European Championship. This region of The Cevennes is known as "Persik's Land" - named after the famous endurance Arabian stallion and sire Persik, who was the only horse to win Florac twice, in 1975 and 1976. The course is one big loop over 6 stages, beginning at Ispagnac at 500 meters (1600 ft), travelling through the Cevennes National Park, climbing to Mont Aigoual, at 1567 meters (5141 ft) and eventually returning back to Ispagnac for the finish. Despite the 350 Euro entry fee, approximately 87 foreign riders have been entered, hailing from Bahrain, Qatar, Germany, Switzerland, Belgium, Slovakia, Spain, Norway, Italy, Netherlands, Sweden, Hungary, Uruguay, Brazil, and Russia. 92 French riders are entered, for a total of 179 horses and riders. The start is tomorrow morning at 4 AM. Portugal is sending 3 horse and rider teams to the 2010 Alltech FEI World Equestrian Games to participate in the World Endurance Championship in Lexington, Kentucky, to be held September 26, 2010. The riders are João Raposo with Titanic (the Portuguese champions 2010), Ana Margarida Costa with Gozlane du Somail, Paulo Branco with Ken du Moulin. The chef d´équipe is Vasco Lopes Avó, and the team veterinarian is Dr. Pedro Jorge. The Portuguese team won the bronze medal in the last World Equestrian Games that were held in Aachen in 2006. It's on 18th September that most of European horses will embarq to Kentucky. They will all head from all over Europe to the Liège's Airport in Belgium. All endurance horses, but also all European horses representing all disciplines. A huge promotion for the Airport of Liège and for the region which has invested a lot in this new airport for boosting its economical activity. Back to endurance... Lexington will not reach the record level of participation of Dubai in 2005. But nevertheless there will be a huge contingent participating at the endurance event. Actually, all nations represented in Lexington will have at least one couple competing in endurance. Maria Alvarez gave birth to a daughter, another little Maria. Just in case, Jaume Punti qualified himself with Nobby during a 160 km race ran in Dubai. But it will be Maria who will defend her title with her small bay Nobby. "Three weeks after the birth of our little Maria, her mother was already riding 40 km workout. Then after six weeks she rode Nobby on 80 km. Both were already ready for a 160 km" said Jaume. The tireless and ever "explorer" Stephen Chidichimo never stops, always in search of experience to the limit, special flavor and charm. After his experiences in raids in Morocco and Spain, it was the turn of Germany, writes the GPS Schwabish Alb - Weites Land Distanzritt of 360 km. Stephen, just back in Italy, had just enough time to send sensations to hot, with a promise to put on paper a more detailed story that could fascinate so many Italian fans. It 's the first time an Italian raid in five-year history of the particular race. L’instancabile ed eterno “esploratore” Stefano Chidichimo non si ferma mai, sempre alla ricerca di esperienze al limite, particolari, dal sapore e dal fascino antico. Dopo le sue esperienze ai raid in Marocco ed in Spagna, è la volta della Germania, il GPS scrive Schwabish Alb – Weites Land Distanzritt di 360 km. One of the things Lexington is best known for is its accessibility to the Thoroughbred stars that reside on the horse farms that dot its landscape. That glance behind the scenes may also give the Thoroughbred racing world a chance to attract new fans. As the owner and breeder of this year's Derby winner Super Saver, WinStar Farm has been inundated with requests to see its sprawling facilities and has responded by offering as many as four tours a day of its stallion barn free from Sept. 18 through Oct. 17. The 32nd Hofmeyr 100 Miler Endurance Ride was held on August 28 with only 26 horses taking part. The Hofmeyr is known to be an extremely challenging course for both horse and rider and only three horses entered the full 100 Miler. The competition among the junior riders all doing the 80 Miler was strong. Jenna Lucas won this division on Lormar Ceasar in a time of 8h49 followed by Ninine Erasmus on Fidel in 8h50 and St Francis Bay’s Jenna Masterson on Xantium Zulu in 9h13. Only 3 horses did not complete the ride. KUALA TERENGGANU, Sept 3 (Bernama) -- Yang di-Pertuan Agong Tuanku Mizan Zainal Abidin is expected to spearhead the local charge at the Sultan of Terengganu Endurance Race in Lembah Bidong, Setiu from Nov 5-7. State Youth and Sports Committee Chairman Rozi Mamat said 100 riders from 12 countries, including Malaysia, are expected to take part in the 120km category endurance race. "So far, seven countries have confirmed their participation," he told reporters here Friday. According to Rozi, United States, Chile, Uruguay, France, Thailand, Indonesia and Singapore had confirmed while the organisers were still waiting for confirmation from UAE, Qatar, Bahrain, Australia, New Zealand, South Korea, Japan and India. He said local clubs competing in the race are Wilayah Equestrian Team, Royal Terengganu Endurance Stable (RTES), Penn Endurance Club, Kelab Tanjung Keling Riding Centre, Ar-Raudah Equine Centre, Langkawi Endurance Stable, Masterscaff Endurance Team and Perlis TSAB Stable. The event, previously known as the Terengganu Endurance Race offers RM30,000 for the winner, RM20,000 for runner-up, RM15,000 for third placing, RM10,000 for fourth and RM8,000 for the fifth, he said. Rozi said the annual event was sanctioned by the Equestrian Association of Malaysia (EAM) and Federation Equestrian International (FEI). Horse fans from around the globe will be heading to Lexington’s Kentucky Horse Park this fall for the Alltech FEI World Equestrian Games. The international competition, held every four years since 1990, will feature the best riders and drivers in eight disciplines — dressage, show jumping, eventing, vaulting, reining, combined driving, endurance, and paraequestrian, which involves disabled riders — over 16 days. This is the first time the event has been held outside Europe. The championships are expected to draw hundreds of thousands of visitors and volunteers to the Bluegrass, although some of them may be staying in hotels more than an hour away. The global economic downturn has taken a toll on travel. Ticket sales for the events, once predicted to top 600,000, now look more like half that. With spectators expected to buy tickets to multiple days, the daily attendance may be similar to that of the Rolex Kentucky Three-Day Event. WALVIS BAY - After a very successful event in 2009, FNB Namibia again supported the 2-day Endurance Ride, which took place on the 2nd of this month at the harbour town, to the tune of N$50,000.00. In response to FNB’s ongoing support, Namibia Endurance decided to officially call the competition the FNB Africa Endurance Championship. Hosts Nambia entered three teams in various categories, South Africa also entered three and a senior team came all the way from Germany, while a significant number of individual riders also took part, bringing the total number of entries to 186 of which 156 finished the ride. The competition is undoubtedly the biggest horse endurance ride in the entire Southern Hemisphere. The various competition divisions were won by: Senior Heavyweight Riders – George Wessels on Aracos Armak; Senior Standard Weight Riders – Collen Tjandja on El Sham Khemo; Senior No Weight Riders – Martell Dormehl on Romeo; TYOung Riders – Alice Krenz on Hidalgo; 120km Child Ride – Chane Viljoen on Zabubega Hakim. ..
Lani van Gerve and her horse Arkab Legato are on their way to compete in the 160 kilometre event at the World Equestrian Games in Kentucky on 26 September 2010. The road to Kentucky was long and required great commitment. In June 2009 Lani and Legato qualified to compete in the Games by winning the South African National Championship over 160 kilometres. Legato went into quarantine at Kenilworth in Cape Town in January 2010. Lani moved from Pretoria to Cape Town to exercise Legato daily for the two months of quarantine. On 22 March 2010 Lani flew with Legato and 23 other horses in a DC10 cargo plane to Europe. In-flight photographs and a short description of the process can be accessed via the link "Legato flies to Europe" at right. In Europe, Lani and Legato participated in Endurance rides in Belgium and the Netherlands. .. Some non-steroidal anti-inflammatory drugs (NSAIDs) at low therapeutic levels might be helpful for horses with inflammation between competitions, so clearer and more current information is needed about detection times for anti-doping testing, according to a Fédération Equestre Internationale (FEI) committee. This committee--the FEI List Group--maintains the official list of controlled and prohibited substances for the organization. The FEI List Group publicly announced over the weekend its recommendation that more research be carried out to determine the exact amount of time low doses of phenylbutazone(Bute) and flunixin are detectable in a horse's blood. With this knowledge competitors can feel confident about treating their horses therapeutically after and between competitions, without fearing disqualification from an upcoming event, said the group's chair, John McEwen, BVMS, MRCVS, who is also the FEI Veterinary Committee chair and the team veterinarian for the British Equestrian Federation. However, the recommendation does not change the status of phenylbutazone and flunixin as "Controlled Medications" on the official FEI Prohibited Substances List, adopted April 5 in conjunction with the new Equine Anti-Doping and Controlled Medication Regulations. McEwen said all NSAID drugs should continue to be prohibited during competitions, and drug testing for these substances should go on as before. The FEI does not currently prohibit the use of NSAIDs between competitions, provided they are no longer detectable at competition testing, and the new recommendation does not change this. LEXINGTON, Ky. - Forget Louisville, Churchill Downs and the Kentucky Derby. This state's real hooved hot spot is Lexington, which immodestly bills itself as the "Horse Capital of the World." In late September Lexington hosts the World Equestrian Games, a quadrennial 16-day event that will decide world championships in such events as driving, endurance, vaulting, dressage (that's the sport in which full-grown horses have to hop around like preteens in their first pair of high heels), reining and so on. Yes, there are world champions in these things. NAMIBIANS topped all the team events at the annual FNB Namibia Endurance African Championship held at Walvis Bay, last week. The event is run under the auspices of the Federation Equestrian International (FEI), the ‘mother’ body of equestrian sport worldwide, and was Namibia Endurance’s (NE) flagship event which boasted a record 186 entries, including teams from South Africa and Germany. The grueling contest consisted of three sections, namely, heavy weight, senior standard weight, and young rider teams, over distances of 30km, 60km, 80km, 95km and 120km. The region around Caen, Normandy, France, site of the 2014 World Equestrian Games, offers many places and events to delight the equestrian. It's not too early to start planning your trip! September 2, 2010--In 2014, the FEI World Equestrian Games will be held in Caen in Normandy, France, during the anniversary of the Normandy invasion of World War II. And it’s not too early to begin planning your trip. Basse-Normandie (Lower Normandy) is an equestrian’s delight with historic stables and spectator events from harness and flat racing to polo, show jumping and more. And, of course, there are also are the things that make France, and particularly Normandy, a wonderful place to visit--local cheeses, French bread, delicious wine, charming 17th- and 18th-century country cottages, miles of white sandy beaches and historic villages around every corner. Following the launch of endurance riding as an official Pony Club discipline in 2009, and with Dengie Horse Feeds as a sponsor for 2010, Pony Club endurance is going from strength to strength and will be enjoying its second championship on September 19 at The College EC, Bedfordshire. The championships are the culmination of Pony Club endurance rides all over the country throughout the year, and entry numbers have again been pleasing with over 50 Pony Club competitors anticipated at the championships. Competitors will be split across junior (eight to 12 years) and senior (over 13 years) levels, both individually and in teams. As with the other Pony Club disciplines classes will be set at novice (32km at 10km per hour), intermediate (40km at 11km per hour) and open (40km at 12km per hour). Spectators are welcome at the event, with no charge for entry. BAHRAIN's Fahad Sulaiman extended his excellent form during his participation in a number of endurance horseride championships in Australia. Sulaiman, a member of the Royal Endurance Team, is finishing his studies in Sydney. He took part in two recent rides during his stay which were over 124km and 160km. The young Bahraini completed the four-stage 124km ride with a total ride time of eight hours, 28 minutes and 44 seconds. This ride started with 36km in the first stage, 30km for the second, 30km for the third while the fourth and last stage is over 25km. He earlier took part in five different rides with his best result winning top spot in the challenging 120-km Australian Open last May riding Nicholas. Sulaiman extended his gratitude to Bahrain Royal Equestrian and Endurance Federation president Shaikh Khalid bin Hamad Al Khalifa for his support to him. He also expressed appreciation to Royal Endurance Team captain Shaikh Nasser bin Hamad Al Khalifa who is continuously backing his rides in Australia. · Points are earned as a combination. · Combination with the most points wins the Series. · In the event of a tie on points the winning combination will the combination with the most qualified kilometres in the Series. If still tied there will be a count back on placings star to decide the winner. · Qualifier Points - each combination that qualifies earns qualifier points based on starter numbers. For example, when there are 20 starters the winner earns 20 points, 2nd place earns 19 points, 3rd pace earns 18 points etc. · Distance Points - each combination that qualifies gets 1 point for every 10km. e.g. 8 points for an 80km ride, 12 points for a 120km ride. · For each ride the Qualifier Points and Distance Points are added together to get a total points score for each combination for that ride. Maria Hagman Eriksson and Cecilia Stråhle Engquist will be representing Sweden as individuals in the endurance competition, which is the first championship to take place at the Alltech FEI World Equestrian Games (WEG) in Kentucky. Maria Hagman Eriksson and Power currently hold the Swedish record over 160 kilometres, which is the same distance as the ride at WEG, and is reigning national champion. Cecilia Stråhle Engquist is based in Houston, Texas, USA and has a choice of her two rides: Aces Comett or Latteefah. Imagine that you have secured a qualification to represent your country in endurance at the World Equestrian Games, a goal you have been working on for many years. You even have the luxury of two horses who are qualified, a gelding and a lovely bay mare, but finances dictate that you focus on preparing only one for the 2010 Games. The gelding is strong and powerful, and he moves up to 75 miles without a hitch. The signs are looking pretty positive. One evening you go out to dinner with the future mapped out, only to find on returning that the gelding is not in his paddock. This is what happened to Alisija Zabavska-Granger, who will be representing Lithuania in endurance at the Alltech World Equestrian Games on September 26th. After she told me a little bit of her life history, I was not so surprised to hear she had overcome this setback. Alisija left her native country of Lithuania because, she said, "Men were dominating and I would have been a slave in the horse world..."
Neil Clarkson from Glenhaven achieved a mighty milestone last week by winning a gold-plated buckle and the Halifax Hayes Fit and Well award riding his Arabian stallion Espirit Sherwood at Shahzada. They came from all over Australia to take part in the annual 400 kilometre marathon ride held at St Albans. For 30 years, the little Hawkesbury village has been the ride base for the longest endurance ride in the world. This year 79 riders ranging in age from 13 to 73 took part in the event where the motto is To Finish is to Win. Starting at 4am each morning, competitors rode 80 kilometres a day for five days in the picturesque Macdonald Valley and the Dharug National Park. Not for the faint-hearted are sections of the track such as Prestons and the Steps whose names belie the challenges they present. Participants are off 'tailing' their horses up and down rocky cliffs which test the endurance of both horse and rider. Twice daily veterinary checks ensure the horses are fit to continue. From October 25 to 10 the World Equestrian Games in Lexington (USA) will offer the world the events bringing together the best competitors of time in eight disciplines: jumping, eventing, dressage, endurance, vaulting, Driving, Reining and Para Equestrian Dressage. Endurance World Equestrian Games will be Sunday, September 26, the day after the opening ceremony. The last mile to consolidate the French team has gone to Compiegne. The young Breton Sarah Chakil to defend the colors of France with Sakalia. The horses of the France team will gather on 14 and 15 September in Vittel to a final work program. Then they will join Cork in order to recover Christophe Pélissié, the veterinary team from France and assistance. All horses selected for the French gaming will take off for Lexington 19, riders will recover them 20. Since August, Sarah connects a program of training that prepares the best for the distance of 160 km. LANDIVISIAU / COREMAs with GRAZIELLA OF SULEIMAN (August 7) - The world's eight years in COMPIEGNE with ORRHA Gargassan (August 20 ) - The trophy sponsors COMPIEGNE with NIAC ARMOR (August 21) ... Coming in the next few days: Monpazier CIS * Monpazier with and again the following day ** CIS will then Florae with SHARARAT (the origin of lameness in Corlay encountered was identified and resolved since). The "world capital of horse" France will host a team of motivated, well prepared. WALVIS BAY - Approximately 200 international horse riders have joined their Namibian counterparts for the annual International Horse Endurance Riding Competition, at the Namibian harbour town. According to the Namibia Endurance Ride Association (NERA), Walvis Bay remains the ideal location for the competition. “It is difficult to imagine any other location where the stamina, perseverance and willpower of both the rider and their steed is challenged. Not only do the dunes provide for some of the toughest endurance and obstacle courses, this course is more difficult than similar races in the Middle East. “We have been very fortunate to enjoy the support of the Municipality of Walvis Bay to host this particular event and would like to see this relationship continuing,” said NERA secretary, Annette Hanekom. WALVIS BAY - The coastal town of Walvis Bay is hosting the First National Bank (FNB) African Endurance Horse-riding Championship. The event, organized by FNB, is said to be “the biggest ever” in Walvis Bay with 195 participants. Apart from hosts Namibia, South Africa and Germany will be represented by riders in various categories, and who are expected to endure an ultimate 120 km ride in the hot Namib desert. “It is a difficult ride because of the desert and the weather. All the horses were thoroughly checked by veterinarians. We have 14 vets to check the horses before the game.